I’m in love with this little tote bag with the fluffy bunny tail! All seam allowances are 1/2″ unless otherwise noted. Let’s start sewing! Pin one lining band to one lining piece, right sides together, and stitch. Repeat for the other lining band and lining piece. Press seams and set the lining pieces aside. 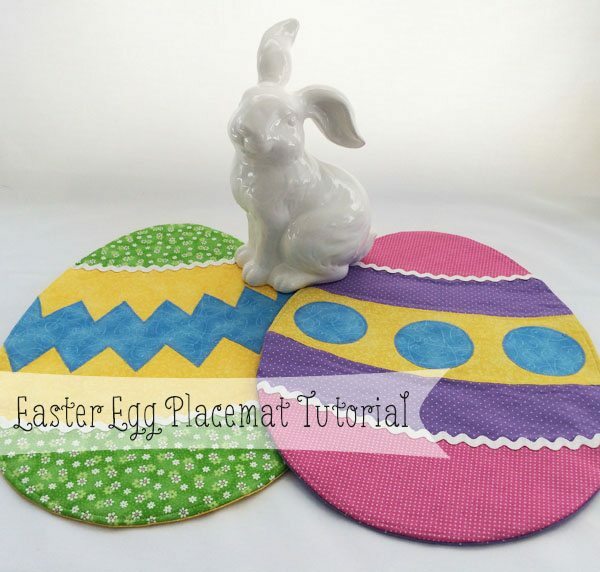 Print out the bunny silhouette and trace it onto the paper backing of the fusible web and attach it to your scrap white fabric. 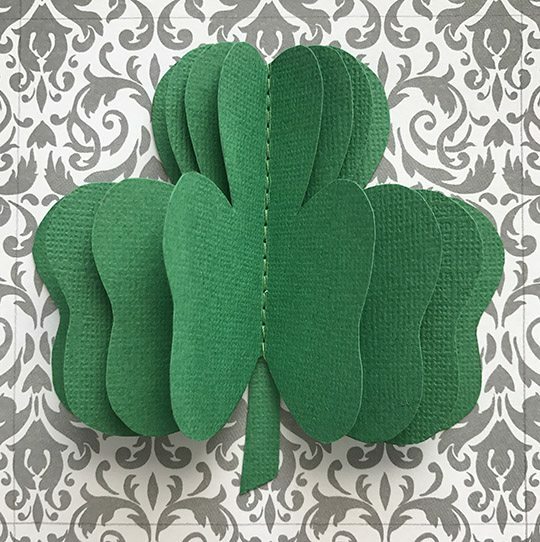 Cut out the silhouette and fold it in half, pinching the fabric at the bottom to mark the center. Fold one of the bag body pieces in half, long sides together, and finger press to mark the center line. Open the fabric up and lay it on your work surface, right side up. Center the bunny silhouette on top, with the bottom of the bunny 3″ from the edge of the fabric. Adhere the bunny silhouette to the bag body, following the manufacturer’s instructions. 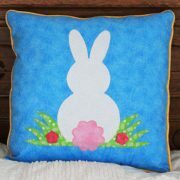 Stitch around the edge of the bunny silhouette with matching thread, using a short zigzag stitch. Next we’re going to make a pompom for the bunny’s tail. Cut a length of yarn about 8″ long and set aside. Wrap the remaining yarn around your hand (or a piece of cardboard about 2-1/2″ wide) to form the loops for the pompom. You’ll want the pompom to be fairly full so it doesn’t droop – I wrapped the yarn around my hand about 80 times. Slide the yarn off your hand (or cardboard) and tie the 8″ piece of yarn around the middle, pulling it tight and knotting securely. Snip the yarn loops open, trim any stray ends and fluff up your pompom. DON’T cut the 8″ piece of yarn yet! Measure up about 3/4″ of an inch from the center bottom of the bunny silhouette and mark with a pencil. Thread one end of the yarn tie through a darning needle and push it through the bunny silhouette and bag fabric about 1/4″ to the left of the mark you just made, drawing the yarn from the front of the bag the wrong side. Repeat for the other tail, drawing it through the fabric about 1/4″ to the right of the mark. Set the front of the bag aside and move on to the two long strips you cut for the straps. Fold each of the strips in half, wrong sides and long edges together, and press to create a center line. Open the straps up and fold each of the edges to the center line, press again. Fold the pieces along the original center line, tucking all the raw edges inside, and press one more time. Top stitch along the long edges of both straps 1/8″ from the edge. Lay the front of the bag on your work surface, right side up. Measure in 3″ from each side of the bag and make a mark along the top edge. Pin a strap to the top edge of the bag with ends of the strap centered over the 3″ marks. Pin a lining piece on top of the bag body, right side down, with the strap sandwiched in between. Sew along the top edge. Repeat for the back of the bag, remaining strap and lining piece. Press seams. Open up the bag front and lay it on your work surface, right side up. Turn the bag right side out through the opening, then stitch the opening closed. At this point, you can box the corners to create a flat bottom in your bag, or skip this step and leave it flat. If you want to box the corners, spread out the side and bottom seams at a corner to create a triangle. Mark a line 1″ from the point of the triangle and stitch. Repeat for all four corners. Push the lining down inside the bag and give the whole thing one last pressing. Top stitch around the top of the bag about 1/4″ from the edge. This is absolutely precious and great for Easter egg hunts! Your tote is so cute. Heading over to get the tutorial. Thanks! Pam, this is adorable! What a great Easter gift. This is super cute! Love the hot pink too. 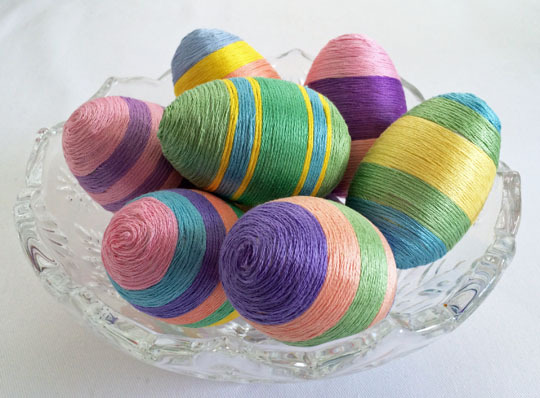 Perfect for spring & Easter. Love this cute bunny bag! Thanks, Ali! The fluffy bunny tail makes me smile every time I see it!